Contemporary. Elegant. Versatile. 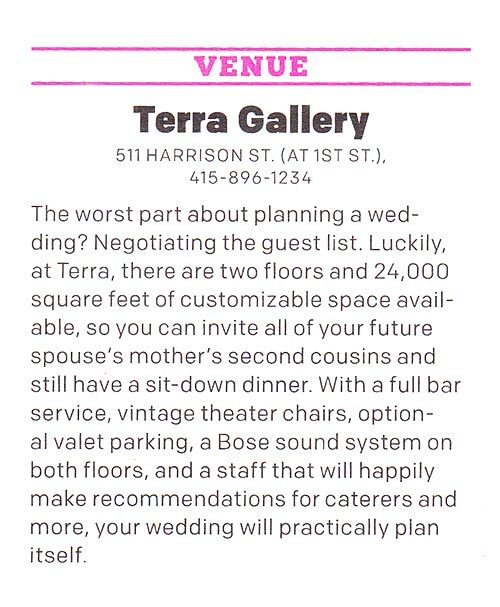 As one of the top San Francisco event venues, Terra Gallery & Event Venue and can accommodate events ranging from large scale corporate meetings, conferences and classes, trade shows, product launches, fundraisers, auctions, screenings and performances…to weddings, intimate receptions and private parties. Two diverse levels with a total of 24,000 square feet can be connected or kept totally separate, providing multiple environments to suit your needs. Terra provides the perfect location for your wedding, corporate event, conference or private party. The spacious open upper level, Terra, has 5,000 square feet of Brazilian cherry hardwood floors, white gallery walls hung with art, soaring 20-foot ceilings and a carpeted reception area with floor-to-ceiling windows with blackout capabilities. Mer, the lower level, has inlaid glass tile serpentine bars, a contemporary receiving room, hardwood floors, a built-in oak stage with lighting, and large restrooms. An adjacent 3,000 square-foot landscaped outdoor area can be tented to host up to 300. Terra is located in San Francisco’s South of Market (SOMA) district on Rincon Hill, just minutes away from top hotels, restaurants, Moscone Convention Center, cultural activities and AT&T Park. Parking and public transportation/BART is nearby. Book your next special event at one of the best event, wedding and conference venues San Francisco. To learn more about how Terra can serve your special event needs, or to arrange a tour, please contact us. “Thank you so much, you were great to work with! Everything turned out better than we could have ever hoped for. The venue looked awesome - quite a few people commented on how nice it was. We had a lot of fun and we think our guests did as well! "Everything went really, really well! We've heard amazing feedback thus far and our CEO even said it was the best event she's ever attended. Thank you to you and your team for all your help. You guys were great to work with, once again. Hope to work with you again next year!" "Terra's experienced event staff is dedicated in creating beautiful and unique events that cater to your personal style. Our wedding was so beautiful & glamorous, I was living my own fairy tale! From the lighting to the music to the food, they made sure everything was executed perfectly. We were so very pleased!" "Over the past four days my inbox has been flooded with gratitude and positive feedback from our guests and the Stitch Fix management team, on your team's stellar level of service and attention to detail. Everyone was thoroughly impressed with the incredible event your team helped to orchestrate." "Terra Gallery and its staff are top notch. Their attention to detail and anticipating the guests needs is subtle yet spot on. The management is approachable and someone is always available to oversee you and your guests. Terra is special and you and your guests feel special attending any event there."